If your oven is not heating up at all, the fan oven element can be faulty. This can be fixed by replacing it with the Fan Oven Element 2400W. The standard element resists the electric flow and radiates heat inside the oven. The replacement element fits select models of AEG branded cookers such as AEG, Zanussi, Electrolux etc. 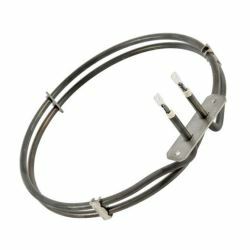 Ransom Spares approved fan oven element suitable for select models of AEG and Electrolux ovens. Great service and delivery ,prompt customer support. When the ovenue stopped working I thought we were going to need a new oven. But my wife Google and founD the how to video. I bought the part thinking it was worth trying. Really simple to fix. Although had to adapt the fixings a little due to corrosion in the oven. Works perfectly again! Quick delivery over the New Year break, really helpful video on the Ransomes website made fitting a doddle. Product perfect and easy to fit.